There are many signs of identity theft some of which are obvious such as when you don't recognize a charge in your card statement or a debit transaction in your bank statement, or, not so obvious such as a new unauthorized account with your name which leads to either delayed fraud detection when you review your credit report or in worst case scenario you never discover the fraud. One of the best ways to detect signs of identity theft is to review account statements and credit reports from various credit reporting agencies. A prompt review of account information and statements will help identify and detect unauthorized transactions or new accounts which were opened in your name. Unrecognized transactions in accounts and credit reports are major red flags of identity theft. Upon discovery of these fraud cases, identity theft victims must immediately develop a plan of action to notify other parties such as the bank, utility company and others and inquire about details of the transactions. In some cases, an identity theft remedy might be to replace credit cards, change accounts numbers, or take other actions. § Failing to receive bills in the mail, If for whatever reason, you don't receive a bill that you normally receive, it is possible that your mail is being diverted to another address, stopped being sent, or was lost in the mail. A persistent missed mail will most likely indicate a sign of identity theft, especially if you have the bill paid automatically by the bank and rarely review the amount paid. § Seeing unexplained bank account withdrawals. This is an obvious sign of identity theft if you are not the one who withdrew money. § Being denied credit unexpectedly. If a case of identity theft affects your credit report, you may be denied new credit lines or loans since companies rely on credit reports to assess your ability to pay the loan back. § Having a merchant refuse to accept your check unexpectedly. § Receiving calls from debt collectors about accounts you are not aware of. 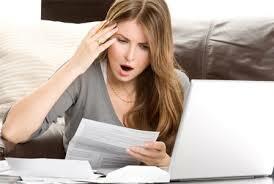 § Receiving bills on accounts you did not know about. § Receiving notification from the IRS that more than one tax return was received in your name. § Being unable to login into your online accounts unless the system is down or you type the wrong ID and password. § Receiving a bill from a medical provider for services you never received. § Having a legitimate claim denied by your health plan because their records show you have reached your benefits limit. § Being denied coverage because your medical records show a condition you do not have. Earn an identity theft certification to detect signs of identity theft.